The Collabor8 Portfolio consists of a range of Sales, Technical & Admin Training for either pure Cisco or mixed Multi-vendor environments. The Cisco range covers CUCM, Unity, IM, Presence, Jabber, Cisco Unified Contact Center Express & Packaged Contact Center Enterprise workshops. The Multi-vendor range covers Microsoft Office Communicator & Lync integration with CUCM and other popular platforms. These workshops cover CUCM v8.6 and v9. To complement the standard Cisco Certification classes, these workshops have been developed to satisfy the requirements of Engineers & System Administrators who require training on the latest software including v8.6 & v9 which are currently not covered by the standard Certification classes. 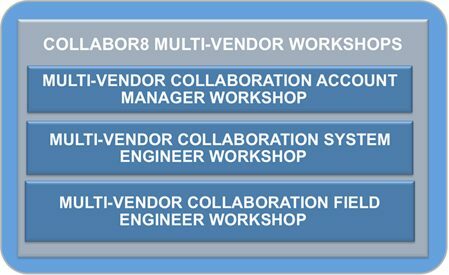 The Collabor8 Program of Multi-Vendor Workshops have been very successful in training Cisco Partners & Customers how to integrate Microsoft and Cisco technologies such as MOC, Lync & CUCM. This latest release has been updated with Cisco’s UC on UCS technology for Microsoft and Cisco server consolidation utilizing the VMware platform.